Foxglove is an introduced (European) garden flower in North America that has escaped and is now found throughout the northeastern and western United States and several Canadian provinces (BC, NB, NF, NS, ON, QC) (USDA 2010). In British Columbia, it is abundant in the landscape in disturbed areas in the southwestern part of the province and sporadically along the coast. It is particularly noticeable along roadways (including forest access roads) which it follows as pathways of dispersal. It is relatively common up to 4000 ft. Flowers are pink to purple, sometimes white. This is an out-crossing, protandrous species (that is, the lowermost flowers are predominantly female, and flowers 3 to 7 are male (Best and Bierzychudek 1982)) that is pollinated by bumblebees. A single individual can produce up to 5000 seeds (Baalen 1982). Germination is directly tied to soil disturbance in this species and is dependent on percentage of vegetation cover. Foxglove is the source of the heart medication digitalis (Baalen 1981). Robust usually biennial herb from fibrous roots; stems erect, 0.5-1.5 m tall, unbranched, densely grey-hairy and becoming glandular upward. Alternate, egg-shaped to lanceolate, 10-40 cm long, coarsely toothed, green and soft-hairy above, grey-woolly beneath, narrowed to the winged stalk, biggest and most numerous at the base in a rosette, reduced upward. Inflorescence a long, narrow, leafy-bracted, 1-sided, terminal raceme of numerous stalked, nodding flowers, the stalks 5-20 mm long; corollas gaping-tubular, 4-6 cm long, weakly 2-lipped, shortly 5-lobed, the lower 3 lobes fused into the longer, more prominent of the 2 lips, pink-purple with deeper purple spots on inside of lower lip, the lips fringed with hairs, sparsely long-hairy in the throat; calyces deeply 5-lobed, the lobes somewhat leaflike, lance-egg-shaped, 1-1.8 cm long; stigmas 2-lobed; stamens 4. Capsules, egg-shaped, about 12 mm long; seeds numerous, small, about 0.5 mm long. Moist to mesic roadsides, fields, clearings and forest edges in the lowland zone; common in SW BC, infrequent in the Queen Charlotte Islands; introduced from Europe. Foxgloves are native to Europe but have escaped from gardens to become well established in coastal British Columbia, particularly along roadsides and in forest clearings. Although magenta-flowered foxgloves are most common, many populations, even small ones, are polymorphic for flower colour. Flowers may be dark magenta, light magenta, or white, and the spots on the flowers may be purplish or yellowish to light brown. The genetics of flower and spot colour were worked out in Britain soon after the science of genetics was discovered in 1900, and the results were published in 1910. Three different genes were involved. One, M, produces the magenta pigment, an anthocyanin, and results in magenta flowers with purple spots. The homozygous recessive, mm has white flowers with yellowish or brownish spots. Its flowers have no anthocyanin pigment. A separate dominant gene, D, darkens the pigment, resulting in dark magenta flowers. So plants with a dominant M allele, for pigment, are dark magenta if they also have a D allele and are light magenta if they are homozygous recessive (dd) for the D gene. The D allele therefore enhances the expression of the M allele. It has no effect on mm plants, which have no anthocyanin pigment in their flowers. In addition, a separate dominant white gene exists. A dominant W allele produces white flowers, even if the plant also has the M allele for magenta pigment. (The recessive allele does not have this effect). A plant that is homozygous mm is already white flowered, so the W allele has no effect in this case. A plant with a W allele is white flowered, so the D allele has no effect on a plant with a W allele. Although the W allele prevents the expression of M, the W allele does not effect the colour of the spots. Thus, a plant with the W allele and the M allele has white flowers with purple spots, and a plant with the W allele that is also homozygous mm has yellow to brownish spots, just like the wwmm plant, which produces no anthocyanin pigment anywhere on the flower. Although no one has attempted to estimate the frequencies of the flower-colour phenotypes in populations in British Columbia, it would be interesting to see if there is any geographic pattern to the distribution of the flower colours. It would also be interesting to watch bees pollinating the flowers to see if individual bees discriminate among the various colours. We do not know if bees visit the different coloured flowers randomly or if each bee sticks to one colour form on each feeding foray. Source: Extracted with permission from Griffiths and Ganders 1983, Wildflower Genetics: A Field Guide for British Columbia and the Pacific Northwest. Digitalis purpurea var. alba hort. Digitalis purpurea var. tomentosa (Hoffmanns. & Link) Brot. Baalen, J. van. 1982. 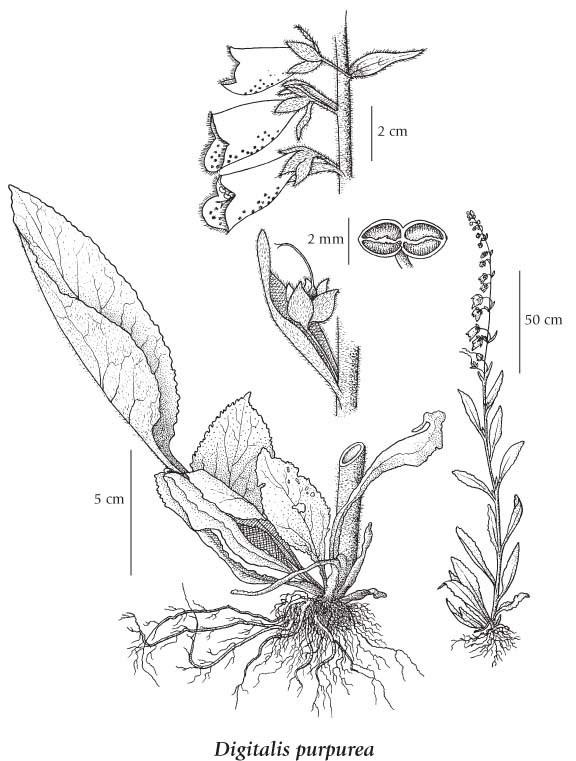 Germination ecology and seed population dynamics of Digitalis purpurea. Oecologica 53 (1): 61-67. Best, Lynn S. and Paulette Bierzychudek. 1982. Pollinator foraging on foxglove (i}Digitalis purpurea): a test of a new model. Evolution 36 (1): 70-79.